Are You a Players Last Coach? Why Authoritarian Figure Coaching Style Fails! Are You a Players Last Coach? I came to find out there were several players with similar stories in the group and all from different local high schools with authoritarian figure coaching styles akin to a military leader. This coaching style had permeated the local coaching culture to the detriment of the local volleyball community in my opinion. This reminded me of something I heard many years ago that shocked me as a coach to my core the first time I heard it. To be honest, having coached over 10,000+ kids in my life I know I have been at least 1 players last coach. I also know that some players are not going to like you no matter what you do. Yet, I also feel allot of coaches are disconnected to this generation of players and their needs. They have lost the ability to motivate the modern athlete and create positive experiences for them whereby they help players develop a love for the sport and value the opportunity to participate and play volleyball. I feel much of this stems from coaches misunderstanding on the modern athlete and what motivates them. A great survey and article on the subject was written by Athletic Director Dr. Marty Durden from Houston, TX titled: Motivating the Modern Athlete. Let’s review each one of these and how I believe through the Volleyball1on1 Coaching Standard you should add this into your coaching style and team culture with a Volleyball1on1 camp. It is important to note and understand most often an “authoritarian figure coaching style” does not effectively address these important player needs! Trust is by far the most important trait for developing strong relationships and motivating the modern athlete. In the past coaches were viewed as an authoritarian figure akin to a military leader. Bobby Knight and Pat Summitt style coaches relied on strict discipline and demanding leadership to achieve success. The modern athlete in most cases seems averse to this style of coaching. Importantly, most parents do not support this style like in the past with the result that players often get supported in their belief which only strengthens their objections to the coach and buy-in to the program. Great coaches by comparison know how to build trust and for those we teach using the Volleyball1on1 “What Great Looks Like!” Coaching Standard, follow a formula based upon science. Contact me to receive “What Great Looks Like!” ™ Volleyball1on1 Coaching Standard Poster! Recent research published in the Harvard Business Review titled: The Neuroscience of Trust by Paul J. Zak, shows several easy to use steps for building trust. We teach coaches how to incorporate these techniques into their program and coaching style. Firstly, Recognize Excellence! (Read More) For those of you that follow me and understand my ideas on “Whole Person Growth” you know how this is a fundamental part of everything we do when coaching. If implemented correctly this can also be used to peak teams and players for playoffs! Secondly, Build Trust Through Challenges! (Read More) What are sports, if not a series of achievable goals and challenges presented to a team on a yearly, monthly, weekly and daily basis? These goals should be challenging yet achievable, thus inducing a moderate level of stress. A goal that produces that level of stress will cause the release of neurochemicals, including oxytocin and adrenocorticotropic, that will intensify a player’s focus, which results in strengthened social connections and building trust. Allow the players to choose the music for the first third or half of practice. Allow the players to choose their own warm-up, or a warm-up from a list that you have provided. We teach our players 20-30 skill building warm up drills (S.B.W.U.D.) and then let the players pick a few for each practice. Once a week or once every two weeks after you have established the team culture, allow your players or leadership council to decide what to focus on in practice. After a match create a space where you ask the players what they think they did well, what they think needs improvement, and what they can do in order to improve. Ask your leadership council for feedback on practice and match planning. Give your players some autonomy on how they would like to prepare for matches. Ceding control in manners such as this will help forge trust between you and your players, and result in a more successful program. Forth, Build Trust Through Sharing of Information! (Read More) Imagine if you worked for a company 20 – 30 hours a week – and yet you had no idea what the goals and strategies of the company were. You simply had your job, you did your job – and then had no clue what impact it had regarding the growth of the company. Well many volleyball coaches follow this outdated strategy and do not share information regarding individual and team goals effectively. 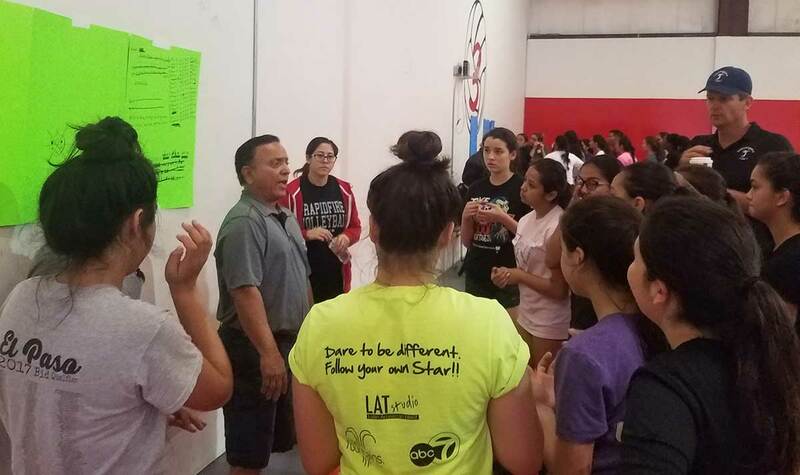 If you would like to learn about our specific tools and ideas related to “It’s Bigger Than Volleyball!” contact Andor Gyulai, Founder of Volleyball1on1.com to schedule a call and review how you can add these powerful ideas to your program. Every day in practice is an opportunity to show you care. Pretty self-explanatory. We also encourage coaches to find opportunities to create and environment to “Recognize Excellence!” This is one of the most powerful ways to show you care. It’s important to understand showing care is a mindset. If you assume an authoritarian figure coaching styles akin to a military leader you will likely not have success with this generation as this style tends not to show empathy or vulnerability. Keep in mind as discussed earlier, being vulnerable is a critical part of building trust. The “Volleyball1on1 Winning Culture” tackles vision or goals using the methods laid out in the 5 Dysfunctions of a Team, namely by helping coaches focus on “Inattention to Results” the top of the pyramid as it relates to the 5 dysfunctions of a team. Additionally coaches are taught proven methods of developing a leadership council as a tool to more successfully work with players toward goals and measurable results. This is not something we focus on with the Volleybal1on1 Coaching Curriculum. We feel this should be community centered and we encourage coaches to do something that is local community focused that build the team chemistry and allows the kids to be vulnerable and have a shared experience to build trust. This is not something we focus on as of yet. This is something we laugh about. I always tell the coaches, you can have the biggest ego in the world, as long as you build trust, show love, empower the players in decision making and lead the team you will have tremendous success. These posters literally act as a compass for how kids play on the court, the team culture and the coaching standard. Please keep in mind these posters are copyright and trademarked and are licensed for use to coaches who run high school summer camps or clubs who run “Train the Trainer” club clinics. I promise you, once you see them, they will forever change how you think about and approach volleyball coaching.